It means not in the safety and comfort of your kitchen, your local natural food store, or a lovely corner cafe or restaurant (well, I guess terrace or sidewalk seating counts as out-of-doors). And out-of-doors usually means no stove, refrigerator, microwave or blender. No Food Network TV shows, no Jacques Pepin TV cooking, and (no, um, computer) so no blogging! How much do you get out-of-doors? A 2006 survey by the U.S. Forest Service showed that about 50% of the population they surveyed, which included all races and ages over sixteen years, participate in day hiking, visiting wild or primitive areas or camping. It’s six years later. Do you think we do more than that now or less? Getting out-of-doors at any level is a good thing to do every day. Sometimes for me, I think I’m doing well to take a walk in my neighborhood every day. Better would be a trip to the mountains, the pueblos, or the beach and do some hiking, swimming or biking. I know some of you get out-of-doors a lot! But I’d bet many of you don’t. You never know what you’ll see when you’re out-of-doors so bring your camera! We cooking fiends will be interested to know there are wild foods out there to identify, pick and prepare. But make sure you have the identifying part down. Don’t want you to poison yourselves. There are many, many beautiful foods growing wild! For instance, there’s Lamb’s Quarters. This is usually considered a common weed–also known as pigweed, white goosefoot, fat hen or wild spinach. Lamb’s Quarters grow just about anywhere and in many climates. You might even have some in your back yard! The plant, which can grow up to six feet tall, is identified by its stem which has red streaks, and its leaves which are diamond or triangular shaped and are about four inches long. The leaves have a few “teeth” on the edges and they are white underneath. In fact, from a distance Lamb’s Quarters can look sort of “dusty” because they often have a white powdery coating. Lamb’s Quarters blooms from July through October. The flowers grow in clusters at the end of spikes. As a general guide, any recipe that includes spinach or chard could feature Lamb’s Quarters instead. They can be washed and eaten raw in a salad, they can be sauteed, added to soups or bread or lasagna, etc. They can also be washed, blanched and frozen! 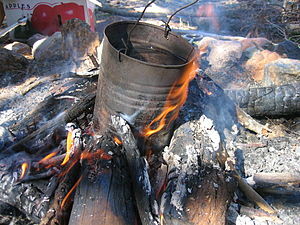 Here’s a simple recipe you can make on your camping stove or right over a campfire if you are out-of-doors. About a two-quart volume of fresh-picked lamb’s quarters, remove only the bigger, tougher stems and wash. Roughly chop the lamb’s quarters and slice the garlic. You will be cooking the eggs and the lamb’s quarters at the same time. Prepare plates with your favorite flat bread or cracker as the base for the poached dish. Heat up a saute pan and add the olive oil. Drop the garlic slices in first and move them around but don’t let them get brown or they’ll be bitter. (Unless you like that taste, then go ahead by all means!) Then add the lamb’s quarters, a pinch of salt and lightly saute them until they are bright green and have wilted. Don’t over-saute or they’ll be soggy. Concurrently heat up a pan of water to a simmer. I would use a wide, low pan that is at least two-quart in size. Pour in a couple tablespoons of vinegar. Gently crack the eggs and drop them into the simmering water. I know. It looks messy. But the vinegar will cause the egg to come together and you’ll get a beautiful poached egg. Cook the eggs about three minutes. Assemble the sauteed lamb’s quarters onto the flat bread or crackers. Lift the poached eggs out of the pan with a slotted spoon and arrange the egg on top of the greens. Salt and pepper to taste. So let’s get out-of-doors and enjoy this beautiful planet! We can combine our adventuring with our cooking and our blogging. Grab your camera, take your guide to edible wild plants, get some exercise while you do some foraging. Cook it all up and take pictures! You can blog about it when you get back! This entry was posted in Cooking, Out-of-doors, Recipes and tagged campfire cooking, edible wild foods, foraging, get outside, Lamb's Quarters, outdoor cooking, Poached egg by mycookinglifebypatty. Bookmark the permalink. I like your enthusiasm, Patty! We often enjoy harvesting Lamb’s quarter from the garden at the beginning of the season. It tastes better than spinach. I try to go outdoors almost every day. The earth is such a gift to us. Thanks for pointing that out. I know you are “out-of-doors” and I so enjoy your photos and stories about that. How do you like to prepare your lambs quarters? Usually I’ve just steamed it and added vegan butter and salt. Your recipe looks good. Yes it is! Thanks, Brian.